Infrastructure-as-a-Service (IaaS)—Leveraging your hardware infrastructure through a cloud environment that is maintained by a vendor. Platform-as-a-Service (PaaS)—Continues to build on infrastructure hosting, but adds software and technology solutions in the cloud. It is not the end solution. Software-as-a-Service (SaaS)—This is about consumption of a pre-built solution that has already been configured. As the consumer, you are completely consuming the solution and not worrying about any infrastructure or application management whatsoever. Understanding the differences between these models is critical for confirming what cloud capabilities and service level agreements (SLAs) you are getting. For instance, let’s say you have made an investment in an IaaS model. In this scenario, you are essentially renting out the physical space to host your software infrastructure in the cloud. 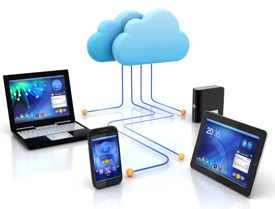 A cloud provider will provide the hardware and middleware for you to install and configure your software and applications. However, you are still responsible for providing the actual solutions – specifically, the applications and the software. Although a cloud vendor can alleviate the burden of having to try to support hardware that can power your applications, you are responsible for maintaining the software infrastructure. If you end up going the IaaS route, but you really wanted a SaaS model in which you are simply consuming a solution through a subscription model, you’ll have completely different expectation levels from your cloud service vendor. This is when confusion in what the model delivers can lead to disappointment in what the provider delivers. What are some of the costly differences that could arise between SaaS and IaaS? Instead of paying a flat subscription fee that encompasses all of the different service capabilities you are getting, you are paying a pay-per-use fee, which is more like the model utilities use. With an IaaS payment plan, your usage costs could rise if you want to add compute or capacity. To avoid the mismanagement of your resources, it’s extremely important that you determine which model makes the most sense for your business needs.